it kind of depends because the games for each system vary, PSP usally having better graphics with more mature games, while the DS does ahve some more mature games alot of the games they release seem somewhat childish in a way to me. Plus PSP can let you watch anime and music. I have both, the DSLite is great for multiplayer and all, but I prefer the PSP because emulation and file storage is a lot simpler. Also, the PSP has much better video and music support since it's built in, while the DSLite doesn't. For video conversion, I use PSPWare. The trial version says you can only convert 5 videos at a time into the PSP, but you can just find the converted files in My Documents and copy from there. It works wonderfully, I've watched FF7 AC on my PSP using that. With external subtitle files, try to find a compiler (I haven't used one yet, too lazy). Use PSP Video 9, it doesn't look as great as others, but it works fine, and its absolutely free. No trial, no crappy no more than 10 min vids. 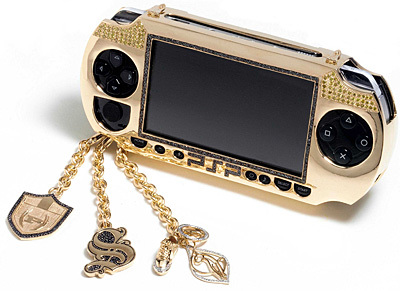 Huh, have you seen the golden-looking PSP "case"? It looks quite good, although I don�t like the black parts as they left a hole for buttons. I use ImTOO PSP Video Converter. I reckon it�s the simplest way how to convert videos for PSP, but also at a very good quality. I always watch PVs on my PSP during school breaks and also when I travel, so it really became one of my most frequently used programs. I have 2 Memory Sticks, 2gb and 4gb and it�s just enough for me. I got the 4gb only for $70, because my grandfather has a premium account in one shop, so we have great discounts on PC stuff etc. PSP is the best handle system I ever bought. I wonder if the new designed PSP can play emulators. I think will take time. I heard that Sony recalled all their old PSP in order to update it with another motherboard so it would be harder to make it homebrew enabled. So the new slimmer psp, i think will be harder to mod as there would be space constrain, higher security. If anyone has or does know of someone, I wanna know what the verdict on it is. Here are a few reviews about the psp slim.